The interior, unlike the history of Project Nomad is progressing nicely. 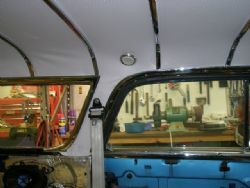 It is always comforting to go and check things out and see numerous advancements in the custom build for the interior. Duncan knows a thing or two about trimming and has plenty of good ideas. So far, we are both on the same page when it comes to how it should look, materials and colour choices. Duncan has raised quite a few “what ifs” that we are incorporating into the build but more on that later. The first job Duncan tackled was the headliner. 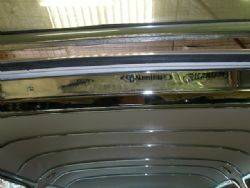 When I bought the Nomad it didn’t have one, just the rusty old decrepit looking chrome internal roof bars. They have been rechromed and look resplendent and when I did a bit of research I found out that the bars are installed in a particular order. I printed this information out and gave it to Duncan to assist in the installation. Apparently these wagons have tack strips that the roof liner attached to. None came with the car so upon realising we needed some Duncan fabricated them from scratch so they could sit a bit lower and do the job better. There were a few expletives but overall after the tack strips were installed the lining went in with few issues. 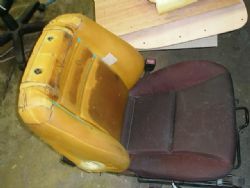 Next up were the seats. 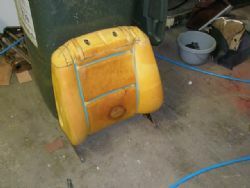 I sourced a pair of buckets out of a HZ Holden one tonner so they could tilt forward to allow rear access. I lucked in with these as this particular model have Velcro strips inserted into the foam which makes retrimming them that much easier. After they were dismantled Duncan suggested we cut them down so they sat at window level and look more period correct. They were quite high and had a headrest built in so after a quick chop they look the goods and are still super comfy. The foam needed to be reworked to suit the lower styling and that has been all done and dusted. Next up is the decision on materials….